Within a couple of years, Arrogant Frog has made itself the mascot of our estates. ‘The Humble Winemaker’ shows that with creativity, expertise and humour, it is possible to take the wines of the South of France to all 4 corners of the globe and to indulge yourself at an affordable price. Arrogant Frog represents our South of France “Art de Vivre”. The Arrogant Frog cuvées are Château Arrogant Frog, Arrogant Frog Reserve, as well as single varietal or blends. Château Arrogant Frog is made up of 20 hectares in Grand Cru Limoux (15 organically farmed and 5 certified by Terra Vitis). Located near to the village of Gaja-et-Villedieu, (100 km from the coast), the vineyards are north-facing and at an altitude of 200 metres in the area most influenced by the maritime climate of the Limoux region. The vines are rooted in clay-limestone soils with shale and stoney, clay soils, producing the best grapes that in turn make the prestigious AOP Limoux and IGP Pays d’Oc wines. Château Arrogant Frog Red wines are made from Merlot, Cabernet Sauvignon, Malbec and Syrah, while the white wines are made from Mauzac and Chardonnay – the vines aged between 11 and 33 years are planted to a density of 6000 vines per hectare and yield 45 hl/ha. The grapes are hand-harvested whilst the vines are pruned using the Guyot simple and Cordon de Royat methods. 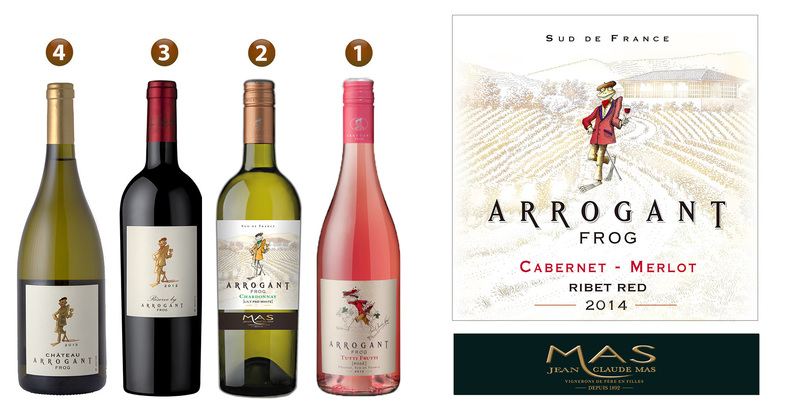 Château Arrogant Frog has won some major awards and the Chardonnay, most notably, is considered a benchmark wine.